Have you ever bought a pack of paper plates to do one activity? And, then have 99 paper plates left over? The struggle is real, right? So, how are you going to use them up? They’re too flimsy to eat on, so that’s not an option. 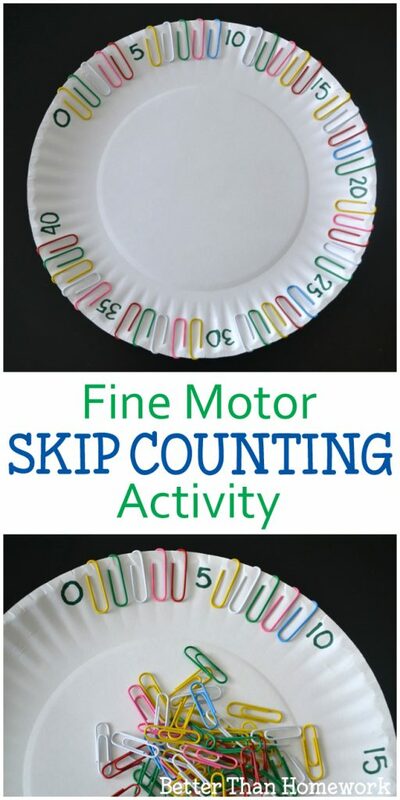 Your best bet is to come up with another fun paper plate activity, like this fine motor skip counting activity. So grab a paper plate and let’s get going! Use your permanent marker and write the number zero near the edge. 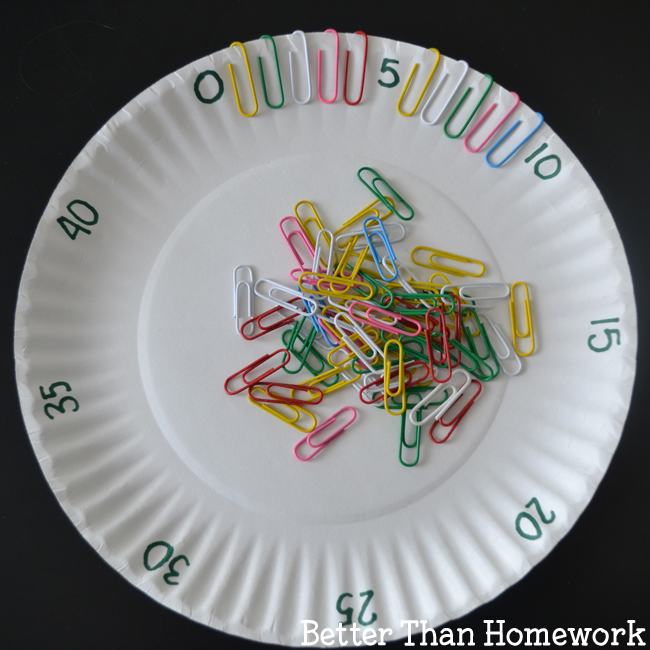 Add five paper clips next to the zero to figure out how far apart you’ll need your numbers. After your five paper clips, write the number five. Continue writing numbers around the edge of your plate, counting by fives, until you make it all the way around. Leave enough room for five paper clips in between each number. Because of this, I only had room for zero through 40 on my plate. Use a second (or third) plate if you want to continue counting to 100. 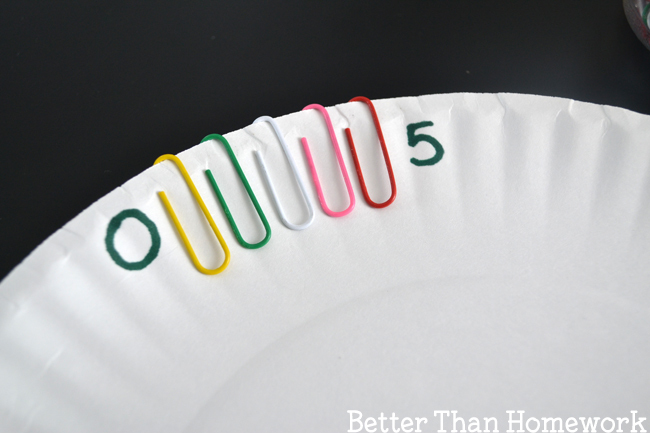 Provide your child with the prepared paper plate and a large handful of paper clips. You’ll need enough paper clips to make it all the way around your plate. 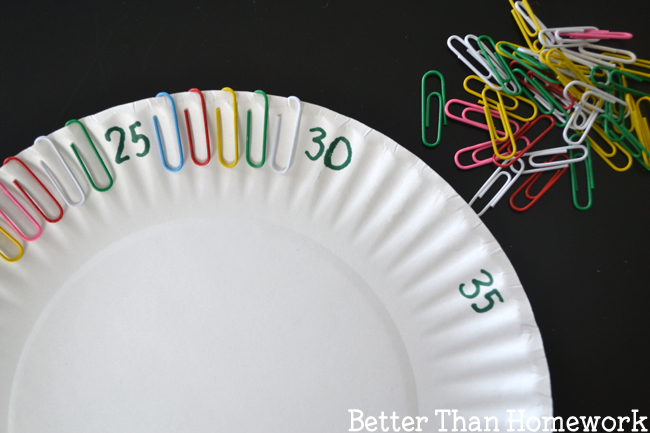 Starting at zero, work your way around the plate by putting five paper clips between each number. Don’t forget to skip count along the way! Work in reverse. 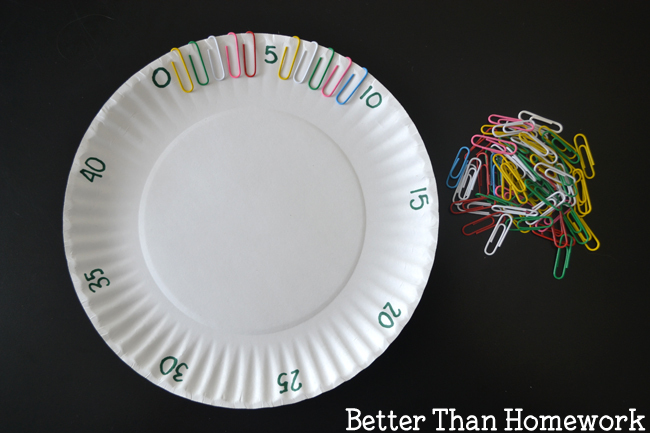 If you have a plate with all the paper clips in place, go back around the plate and remove the paper plates while practicing skip counting. Use this concept to practice any set of skip counting. Place the numbers further apart to count by tens or closer together to count by twos. You can have paper plates for counting by threes, fours, or even sixes. Use this for any set your child needs to practice. Attach a plastic bag to the back of your plate to store your paper clips. Now, you have a great busy bag activity for your elementary-aged kid. How would you play with this fine motor skip counting activity? If you enjoyed this fine motor skip counting activity, the above photo is perfect for sharing on Facebook. Or, you can share the next photo on Pinterest.